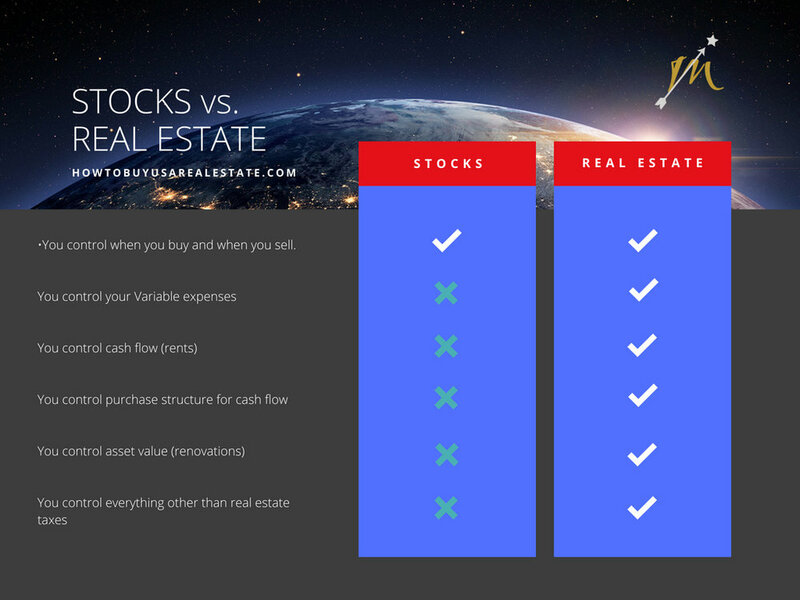 How does Real Estate compare to Stocks in your Investment Portfolio? As my business partner always says, “I only use my power for good”. Indeed, great benefits are bestowed upon you when you use your power for good, but do you have the power you need “to do good” with it. Establishing value for investment property, and “how do I know if this real estate investment is better than stocks,” have been a repeated question lately. This tells us that you can benefit from the power of knowledge around investment s and knowing how to place value on them. So let’s look at this starting with the questions real estate or stocks? · You can control when you buy and when you sell. · Um. That is pretty much it, the rest is all in the mercy of how the stocks performs. · You Control When you buy and sell. · You control how much renovations you may want to do to control the value of rents. · You control how you structure the purchase to increase cash flow and or tax deductions. · You control pretty much everything other than taxes. Let’s look at twin brothers. Identical twins by looks, but two different personalities when it comes to investing. Twin brother Dave invest $20,000 in the stock market, while Brother Jeff wishes to invest his $20,000 as a down payment on a $100,000 investment house which he will leverage by financing 80% of the value on a 15 year mortgage. Twin brother Dave: Google University will repeatedly tell you the average stock returns 7% per year. Using that as our example, Dave’s stock was considered an average stock then a 7% growth added each year would go from $20,000 to $56,986 or a gain of $36,986. While Dave's $20,000 turned into an investment worth $56,986 Jeff’s investment turned into an investment worth $211,388 in real estate. Oh, it is just getting good. Real estate offered Jeff an unfair advantage. While Dave and Jeff both enjoyed growing values to their investments Dave’s stock investment simply grew over time. Jeff’s real estate not only grew over time, it also offered him positive monthly cash flow which grew each of the 15 years as most his expenses were fixed. Plus real estate is one of the best tax shelters available, so Jeff was able to benefit from his numerous real estate tax deductions and depreciation schedule reducing the amount of taxes he paid each year. Now that you were able to see how stocks compared to Real Estate., let’s look at the second question which is how to place value on real estate: IRV (Income, Rate, Value). Larry Arth is a coach and writer for HowToBuyUSARealEstate.com. Contact admin@htbusa.com for information regarding classes and bookings.